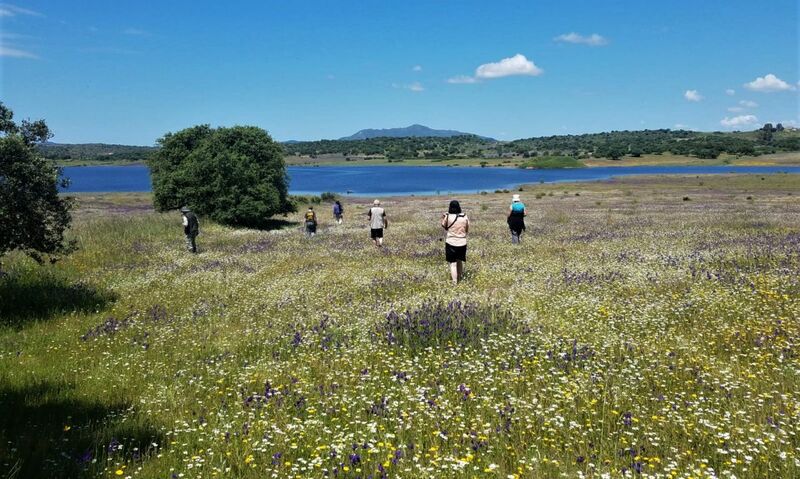 On the 30th April 2018 I joined 12 desperados as we boarded our flight to Spain to begin a memorable nature tour of Extremadura. I would be co-leading with my Spanish based partner Teresa Farino of Iberian Wildlife Tours. Our week-long tour was based at the Casa Rural Las Canteras, on the edge of the Steppe close to the town of Trujillo. 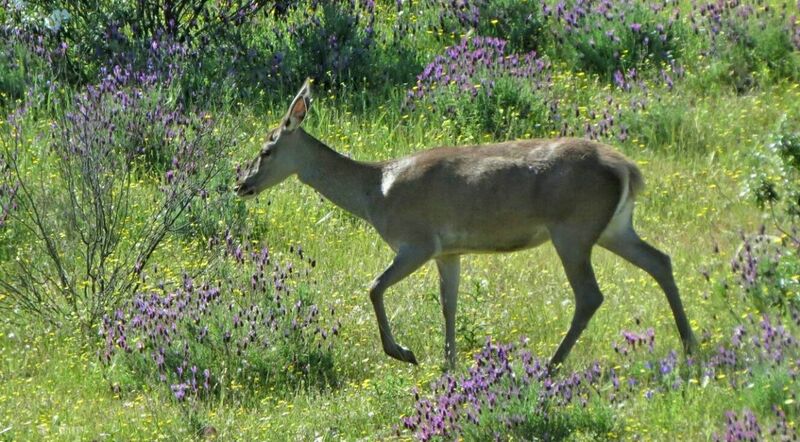 The location was well chosen and spotting wildlife in and around the hotel was part and parcel of the daily routine. 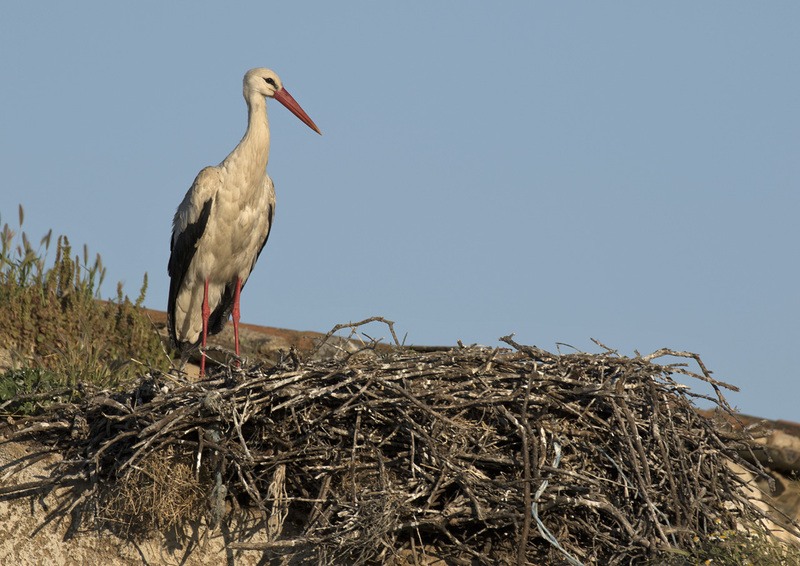 By far the most obvious birds were the many nesting White Storks, including several on buildings in the grounds of the hotel itself. 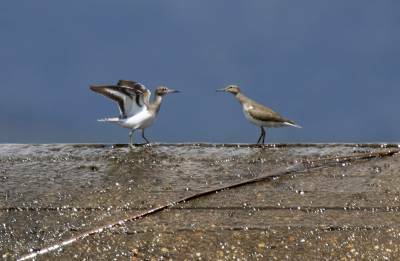 The sound of clappering bills became the tympanic backdrop to our tour. 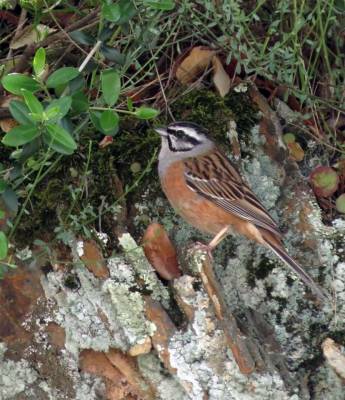 Possibly one of the most enduring memories from the week for most folks would be the humungous gathering of House Sparrow roosting in the bushes, either side of the path, leading to the hotel entrance. The noise at dusk was ‘painfully’ loud and fantastic. 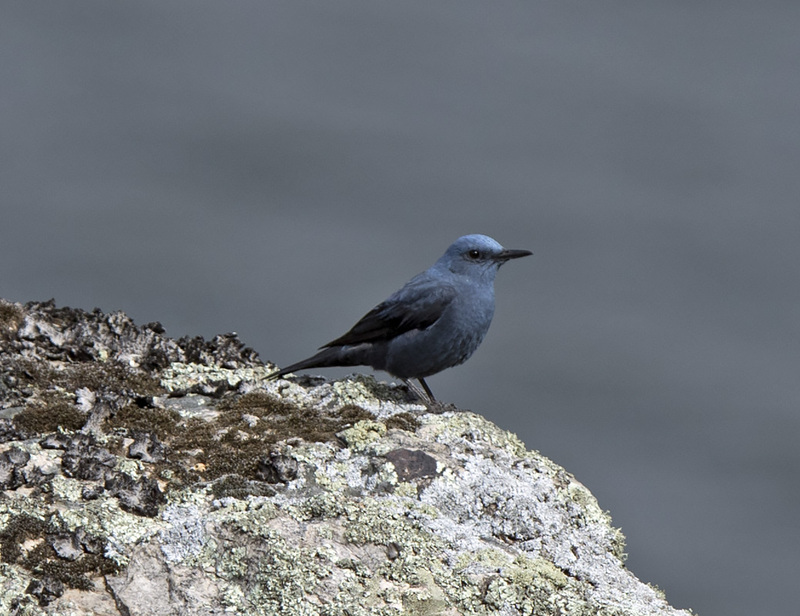 Rather than provide a daily list of sightings this blog is going to pick out some of the stand-out elements from the tour. 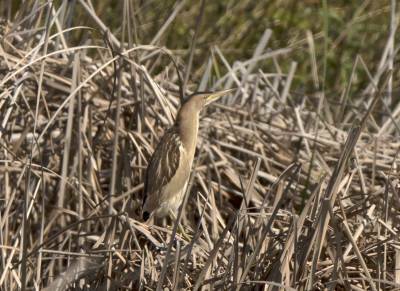 Unlike the majority of tours to the region, that concentrate only on the prolific birdlife, this one was searching for all kinds of flora and fauna. Botanically speaking Extremadura is not one of Spain’s diversity hotspots, but what it lacks in species variety it more than makes up for in the blaze of colour washes present in May throughout the two major habitats of steppe grasslands and dehesa (wooded pasture/arable system). The colour purple was certainly the most vivid and it comprised principally of breathtaking swathes of Purple Viper’s Bugloss and French Lavender. 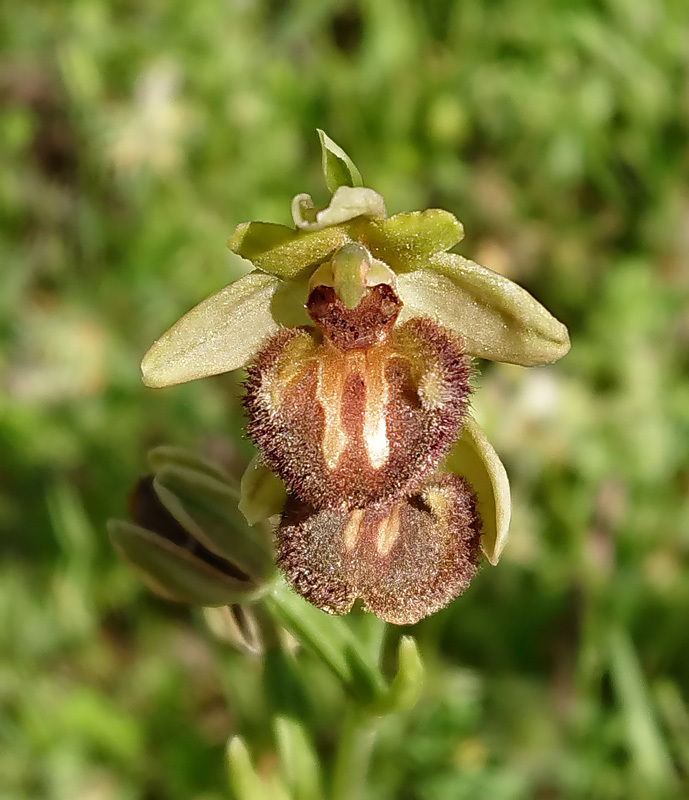 Probably the most sought-after plants are the Orchids, it’s getting a bit late in May to find them in numbers and variety in Extremadura, but spring 2018 had been cooler and wetter, prior to our tour, than normal and so we were fortunate to find some prize specimens, notably on the day we visited the renowned orchid rich site of ‘El Sierro’. Here we would find Bee Orchid, including a rare variant ‘almaracensis’, Early Spider Orchid, Yellow Bee Orchid, Naked Man Orchid, Common Tongue Orchid and Small-flowered Tongue Orchid. 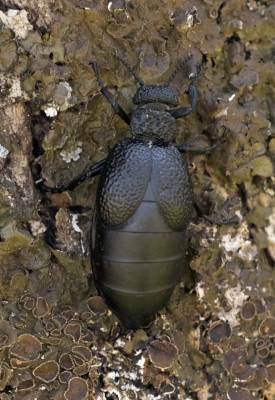 Many of Spain’s invertebrates are large and impressive, especially when compared with the impoverished invertebrate fauna of the UK. 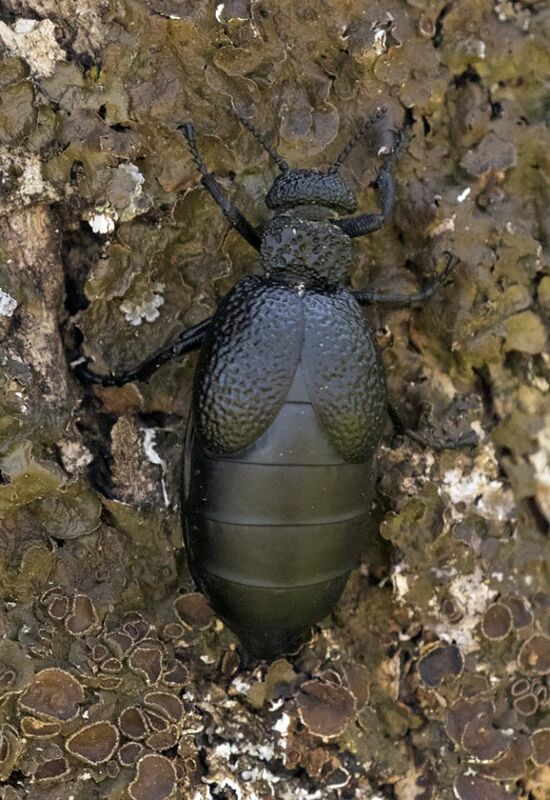 Whilst at the aforementioned ‘El Sierro’ we were able to compare two noted species of Oil Beetle, Striped Oil Beetle, which is common throughout Extremadura and its heavyweight cousin Meloe tuccinus (tbc). Despite the blaze of colourful flowers, butterflies were rather thin on the ground and in moderate diversity, with just 26 species noted. 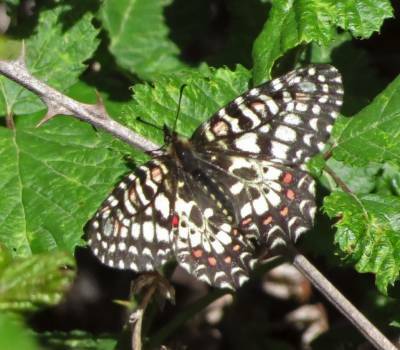 Nonetheless we enjoyed a fine selection, from extravagant spectaculars like Spanish Festoon and Spanish Scarce Swallowtail to the subtler beauty of, Spanish Marbled White, Black-veined White and Panoptes Blue. The Commonest butterfly of the week was probably Black-eyed Blue. Our ‘mothing’ was limited by cold overnight temperatures for most of the week, but we still found a few species the most distinctive of which was the endemic Cleonymia baetica, a rather striking, spiky, little moth of the noctuidae family. 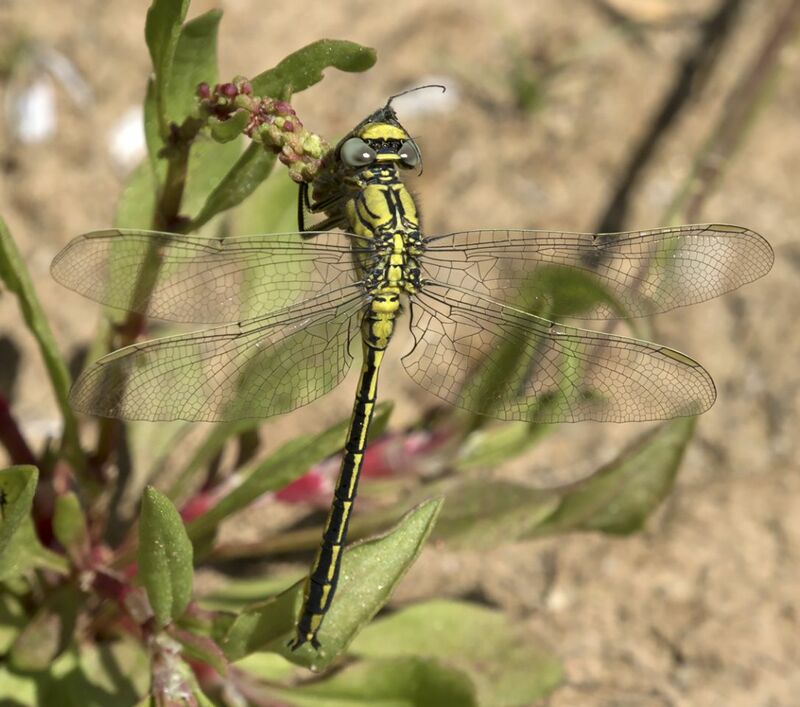 Other memorable invertebrate finds included Western Clubtail dragonfly, Egyptian Grasshopper and the Common Yellow Scorpion. 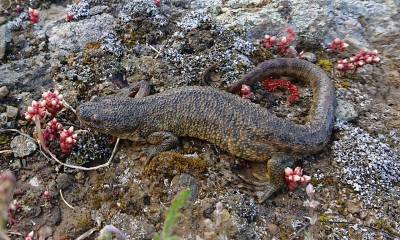 Reptiles and amphibians are very much a feature of Extremadura. They may be abundant, but they are by no means always easy to find, with one or two exceptions. 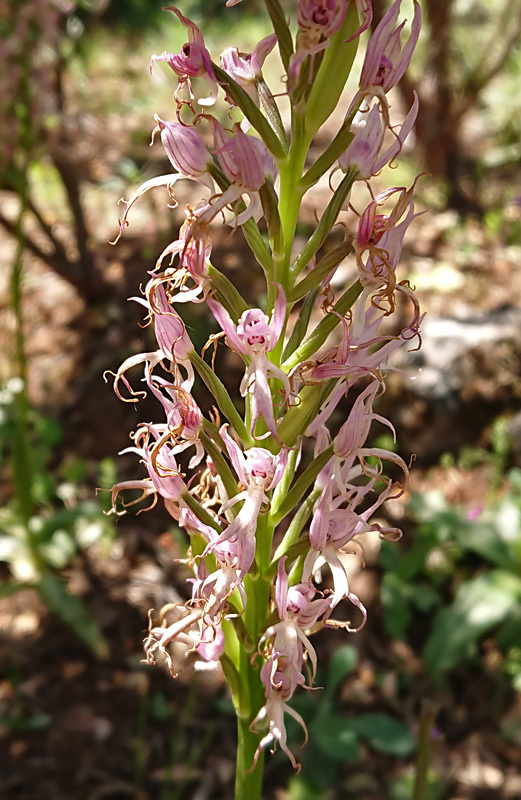 We ended the tour with a total of 16 species. Large Psammadromus being the most frequently encountered reptile, whilst it’s Western Psammadromus cousin was located only once. 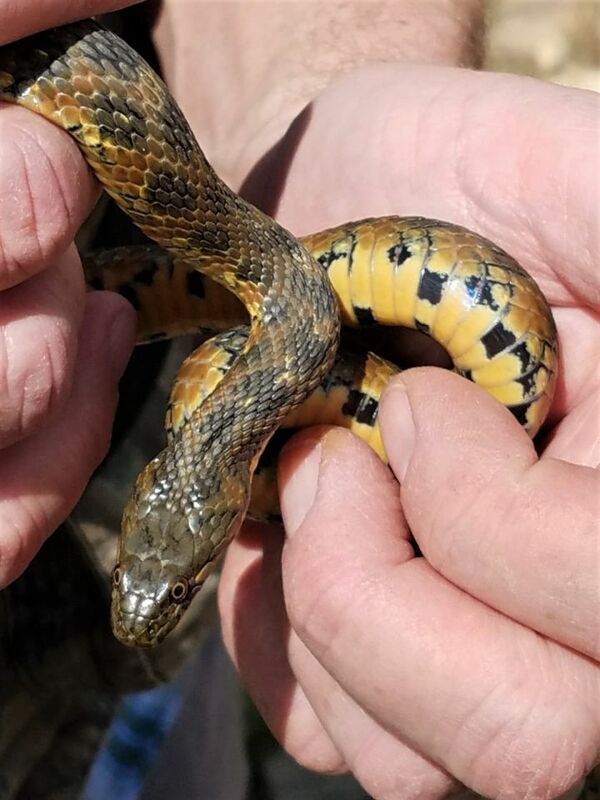 Along the banks of the Rio Almonte we were fortunate to find a few Viperine Snakes. These beautiful and harmless snakes are typically associated with water bodies, where they hunt fish and amphibians. 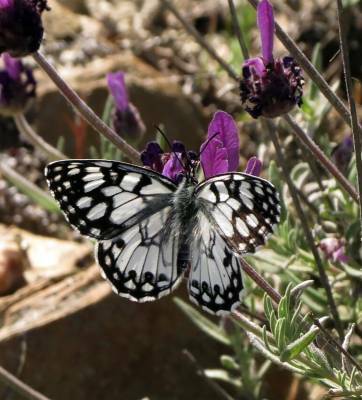 We spent a considerable amount of time enjoying the delights of the renowned Monfragüe National Park. 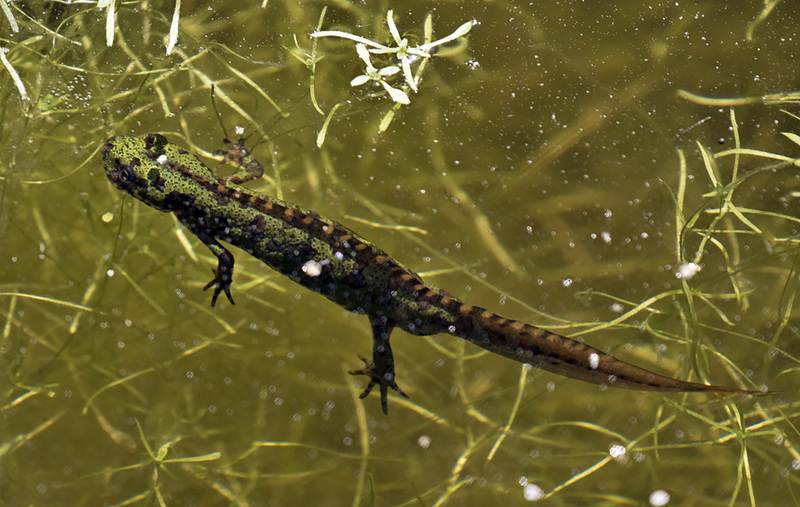 On one of our walks we descended from the Monfragüe Castle to a small pool full of macro-phyte plants, as we gazed into the clear waters, we could readily spot the breeding newts, including the endemic Bosca’s Newt. Alongside it was the strikingly marked Southern (or Pygmy) Marbled Newt. Getting a decent image was less easy than spotting them. In other parts of the park we would find more regular fare in the form of the recently split Spiny Toad and Iberian Water Frog. 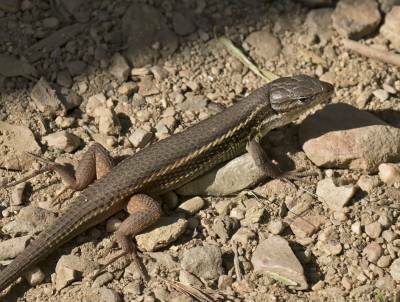 We could even find reptiles and amphibians in and around our hotel. During our meals it was typical that one or two Moorish Geckos would engage in a territorial battle on the dining room wall. 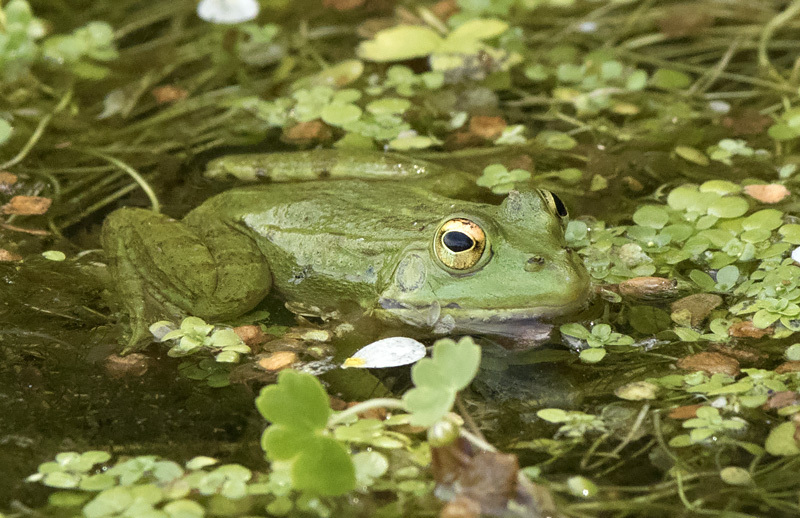 We even found a Stripeless Tree Frog sitting among the pot plants in the dining area. Probably the best find however was made by Teresa as she headed across from her billet in the pre-dawn to prepare the day’s lunchtime picnic feast and discovered a Sharp-ribbed Newt enjoying the damp ground created by a water overflow. 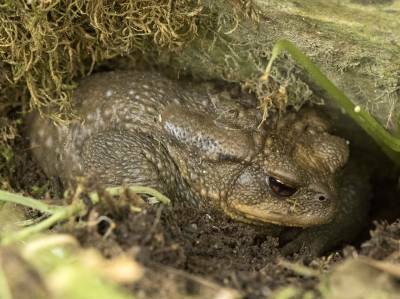 Mammals are always a challenge to find, most are nocturnal and elusive. 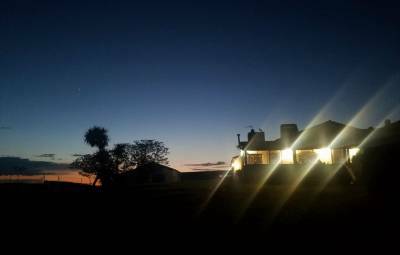 We undertook some bat detecting in the vicinity of the hotel and this revealed the certain presence of Soprano Pipistrelle, we also recorded another species of Pipistrelle alongside either a Leisler’s, or a Serotine bat. Foxes are common in Extremadura and it was no surprise that we had a few encounters, usually as we were driving between sites. In a similar vein we also spied our only Red Deer, a hind as we drove between locations in Monfragüe. Picture the scene: We are standing quietly on a dusty track as the fiercely blazing sun dips below the horizon. 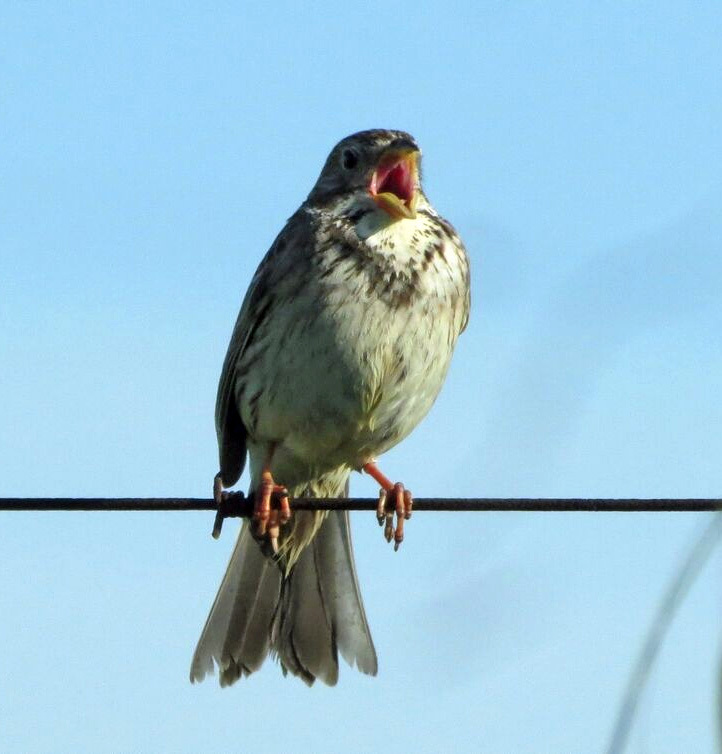 A roving band of vagabonds (Iberian Azure-winged Magpies) chatter noisily in a pre-roost gathering, Common Quails “wet my lips” in the neighbouring cereal field and dashing flocks of Spanish Sparrows rush pell-mell towards their roost site. 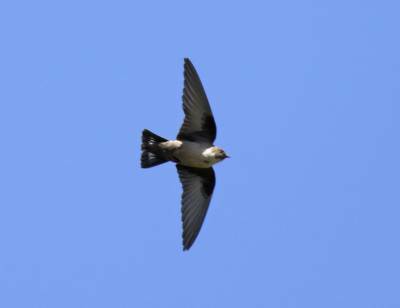 The magpies soon follow and the evening chorus dissipates. A switch is flicked, and day becomes night. 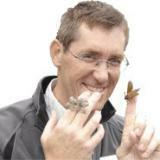 It’s heralded by the electronic ‘ping’ of a Scops Owl that emanates from a nearby Holm Oak. Another silent hunter now breaks the skyline, the Long-eared Owl soon reaches the cereal field and begins to quarter the crop in search of rodents, soon it is away and gone over the roll of the landscape. Now is the appointed hour. Promptly, close at hand, a mechanical repetitive “ka-tok – Ka-tok – Ka-tok” beats out rhythmically through the gathering gloom. It stops. The clap of a wing and it appears, a scythe-winged bird on puppeteer’s strings, jinking across the darkening sky with a lightness so characteristic of its tribe. 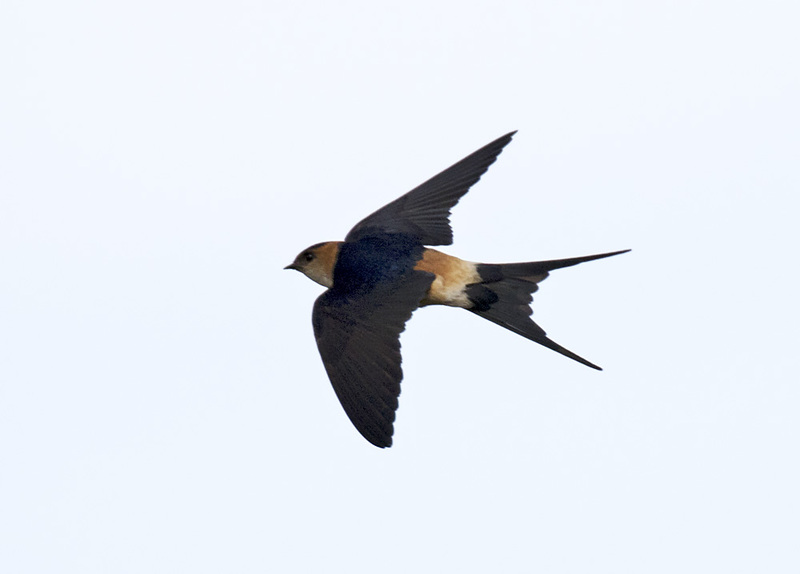 There is still enough light left to make out the white patches on its wings. A Red-Necked Nightjar is beating its bounds. 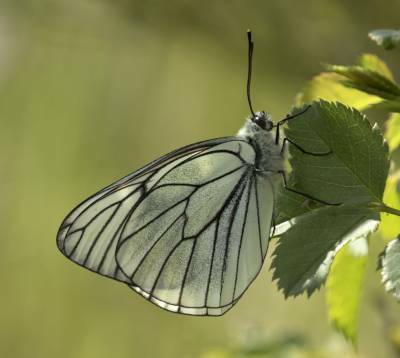 Nature at its most sublime! When it comes to birds Extremadura and raptors are synonymous. 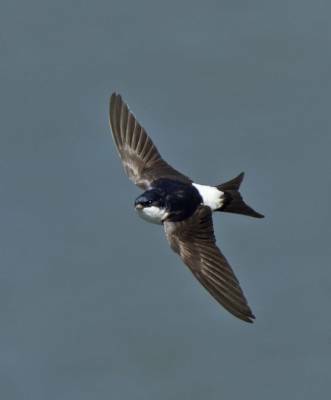 If the weather is decent there is barely a moment when a scan of the sky doesn’t reveal at least one bird of prey, and usually the sky is dotted with soaring birds. By far the most obvious are the vultures. 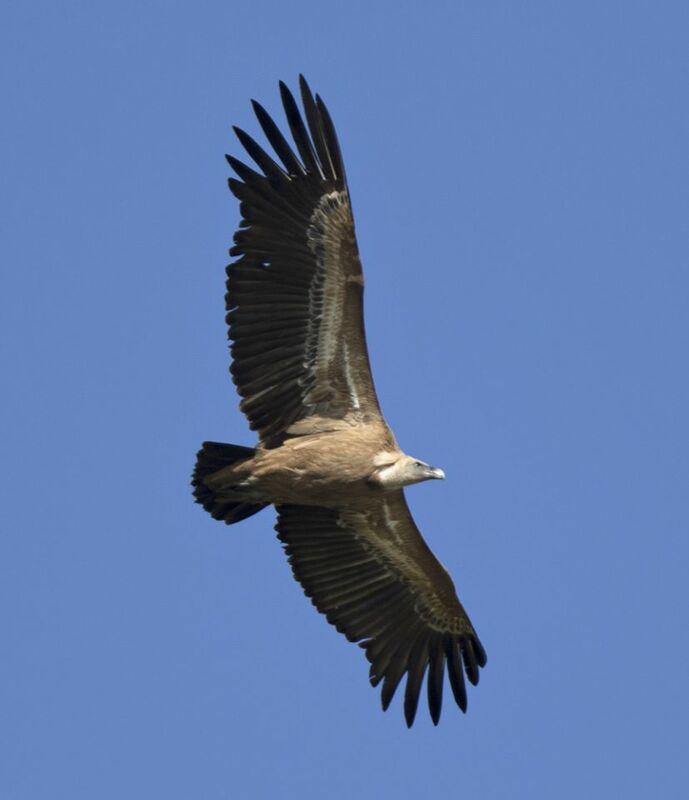 Griffon Vultures form kettles over the landscape as the scan the vast areas of steppe and dehesa for dead and dying livestock. Once their target is located the sky empties like water down a plughole, as vulture after vulture spirals in to partake in the feast. 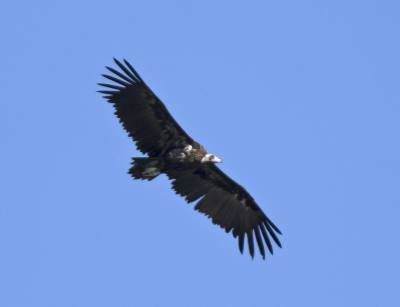 Alongside the Griffon Vultures you find the mighty European Black (Cinereous) Vulture. 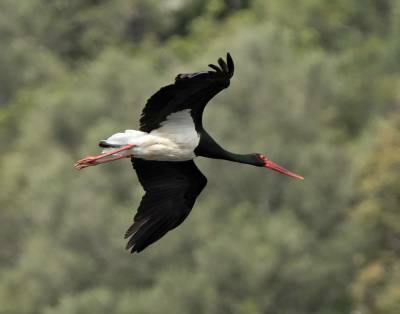 Extremadura and Monfragüe in particular, is the mighty bastion of this impressive but seriously threatened bird. 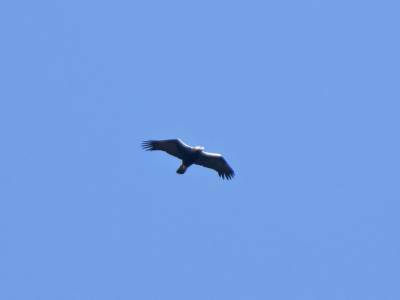 Every time I look at one soaring overhead, it puts me in mind of two ironing boards strapped together, so vast is its wingspan. The third member of the vulture family periodically found high over the majestic landscape is the strikingly coloured Egyptian Vulture. 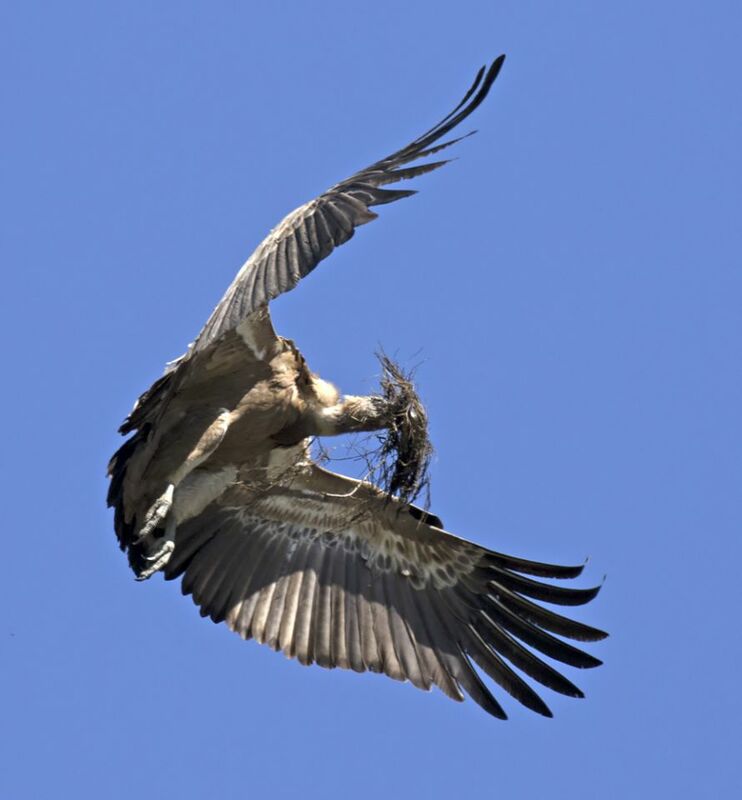 It’s usually last to the party, a hanger-on left to pick at the stripped carcass. 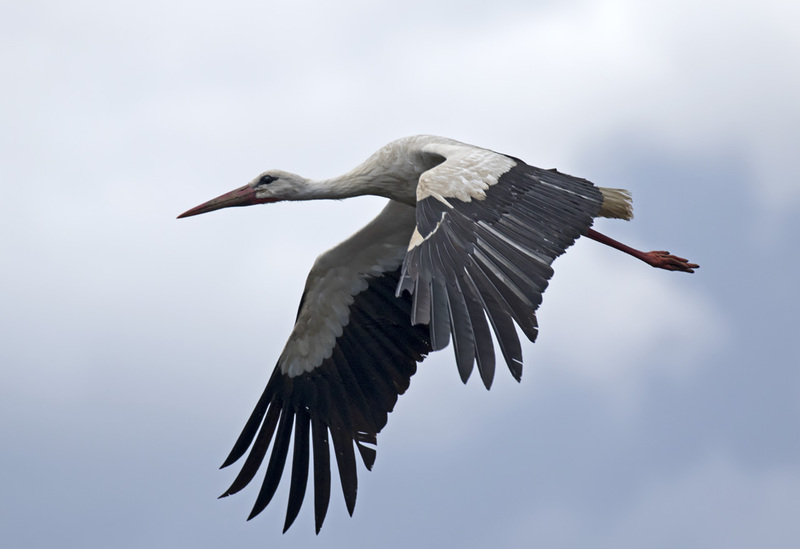 In comparison with its clumsy cousins it’s a dynamic flyer and rather more nimble-footed on the ground. 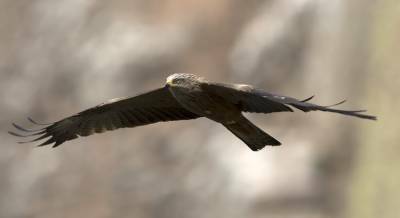 Eagles and Extremadura have a harmonious existence, most nest in the dehesa, or on rocky pinnacles, but they scour the steppe for prey. 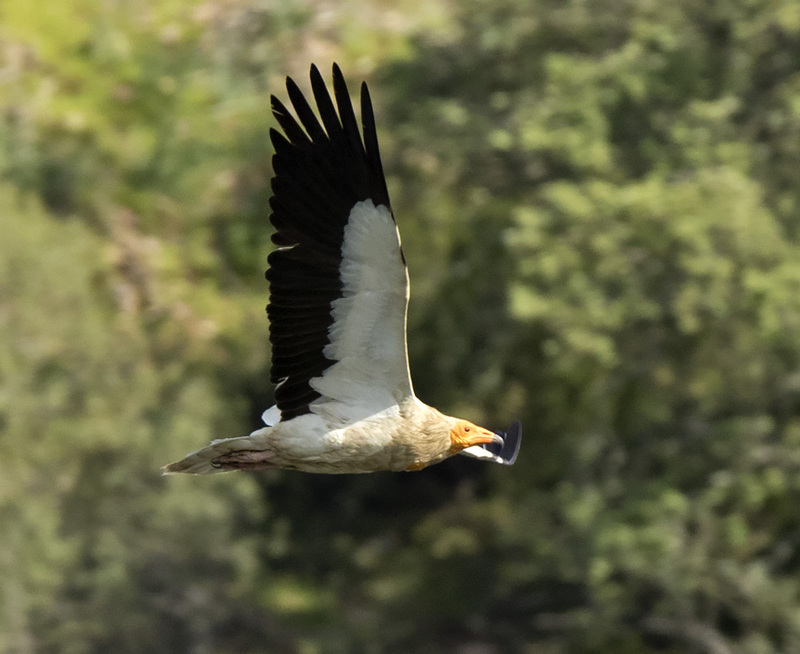 The Imperial Eagle sits on the throne, a must-see for every visiting birder, they are backed up by Bonelli’s, Booted, Short-toed and even Golden Eagles. By far the commonest raptor in the region is the Black Kite, you find its characteristic kink-winged, dropped-hand profile on almost every scan of the sky. We had many seriously close encounters. 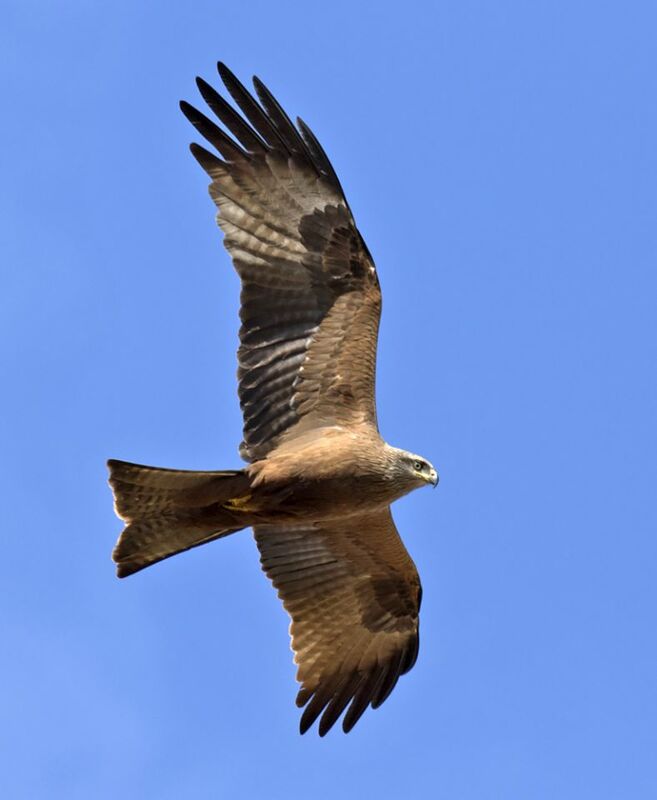 Its Red relative was far less numerous, and the Black-winged Kite was even more elusive, with just one sighting as we drove between Madrid and our hotel on the first day of the tour. 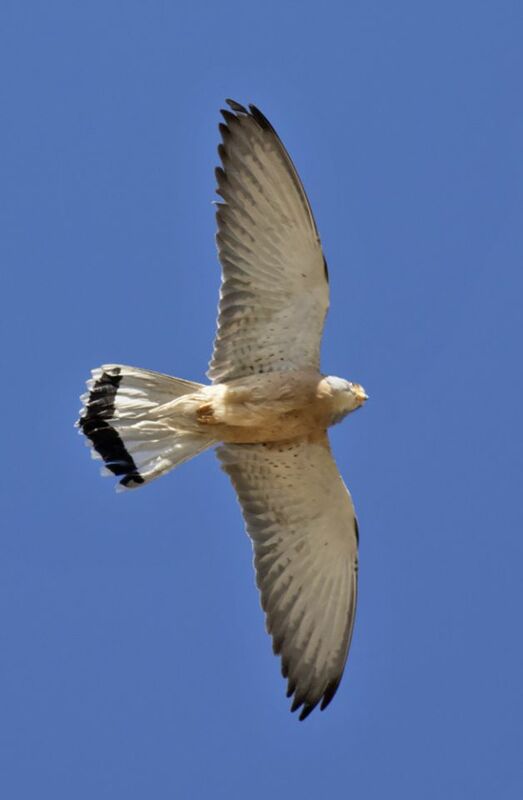 Harriers are very much part of the Extremadura raptor fest. 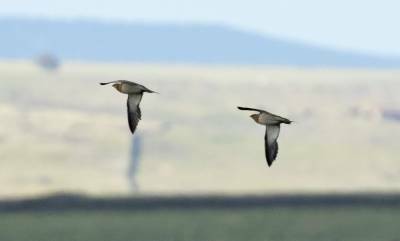 Montague’s Harrier is readily found in the grassy areas of the steppe and Marsh Harriers are found reasonably easily in areas of reed filled wetland. It was something of a surprise when the only harrier we successfully photographed fell into neither camp. We were in harrier hunting mode one morning as we traversed the Steppe between the hotel and Santa Marta de Magasca. 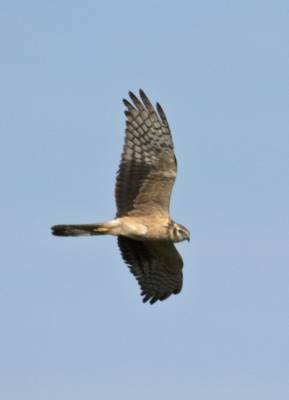 We hadn’t gone far when a distant juvenile harrier gave us pause. Instinct told me it was a Pallid. We drove closer, piled out of the mini-buses and soon we had some good close views of a rather distinctive looking juvenile harrier. It was possessed of all the pre-requisite ID characters of the Pallid Harrier. A wanderer from the steppe of Eastern Europe. I’d successfully read the weather runes by suggesting the easterly winds might bring us one of these prized prairie pouncers. 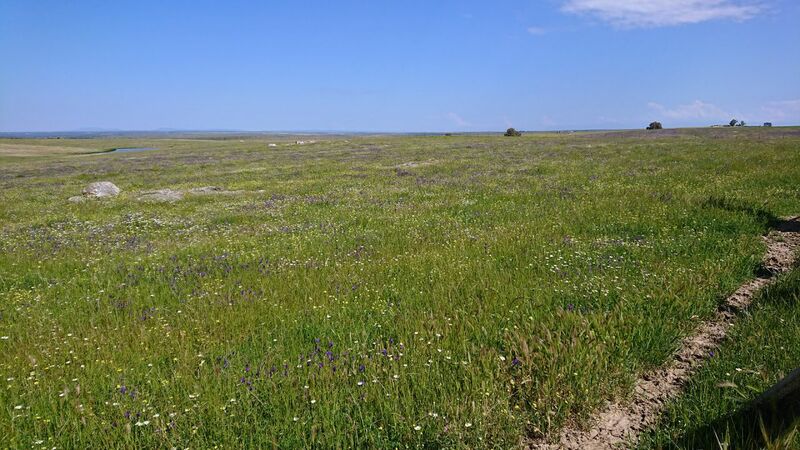 The steppe positively heaves with Corn Buntings and various larks. 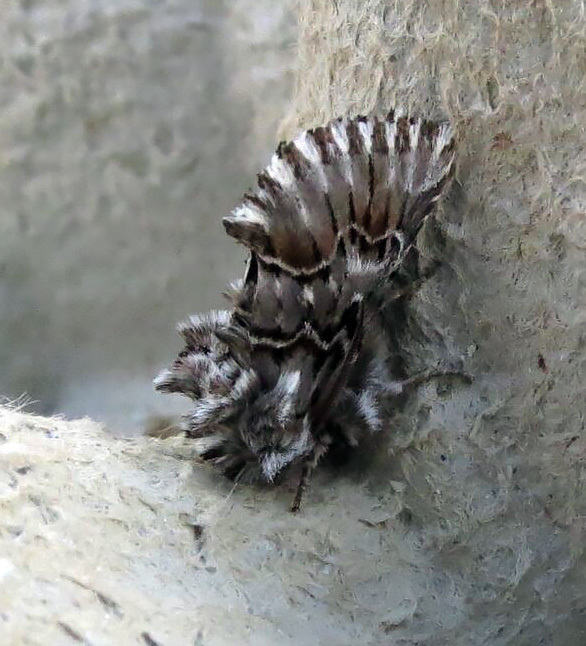 By far the commonest to be encountered is the Thekla, a real ID challenge when separating it from it’s Crested congener. 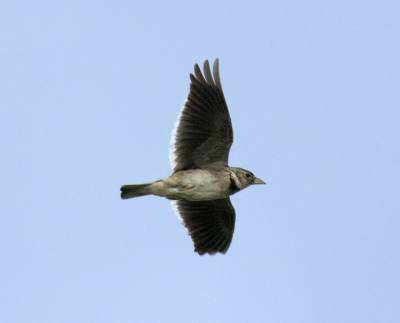 This is backed up by big numbers of a lark with a much chunkier bill and what looks for all the world like a natty neckerchief. 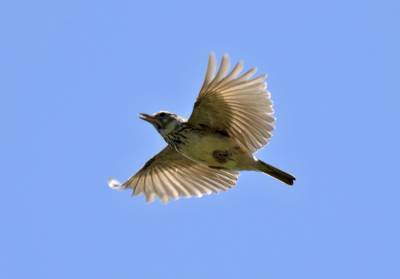 Calandra Larks swing about the sky singing their hearts out, but their heavy headedness and longer, rather slender winged, profile makes them readily separable from the broad-winged Thekla’s. 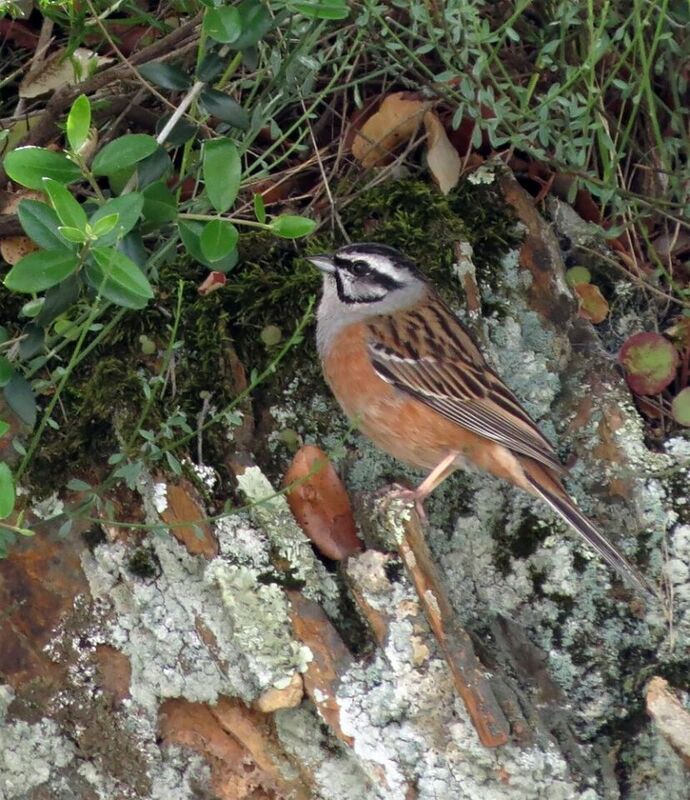 Amid all this activity it is easy to overlook the dainty Short-toed Larks. Our best view came whilst watching the king of the steppe. 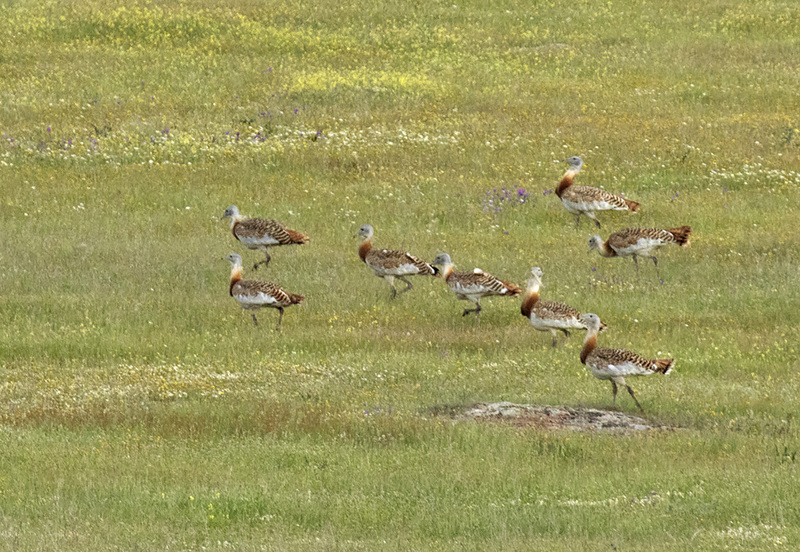 Great and Little Bustards are intrinsically linked to the steppe of Extremadura. That doesn’t always mean you will see them at close quarters. 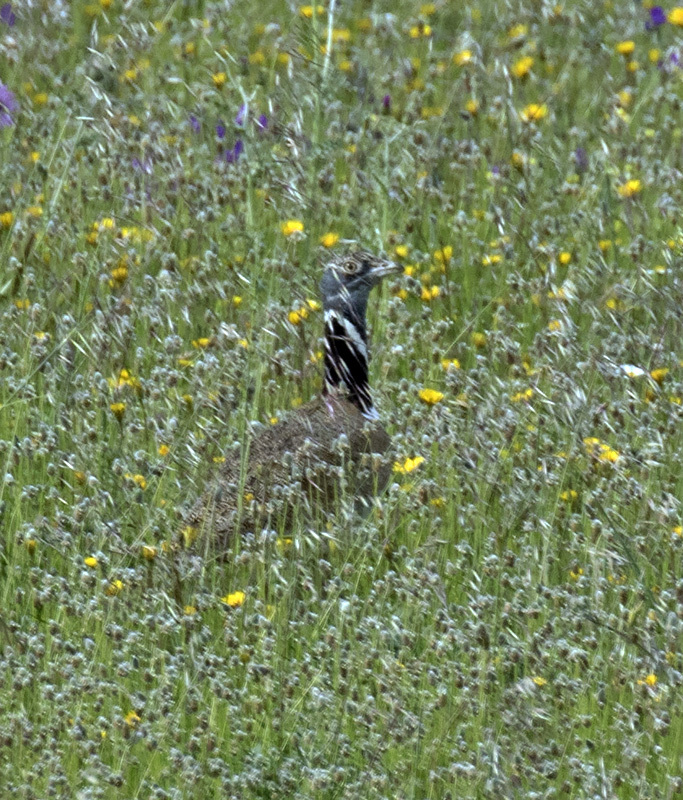 A soon as the sun strikes the soil of the region it sets off a blistering heat haze, so even bustards at a moderate range become shimmering holograms. It’s early morning, or late in the evening, when the air calms that usually reaps richer rewards. So it was that late one evening we found ourselves paying homage to ten Lords as they bestrode the prairie-like landscape near Trujillo. 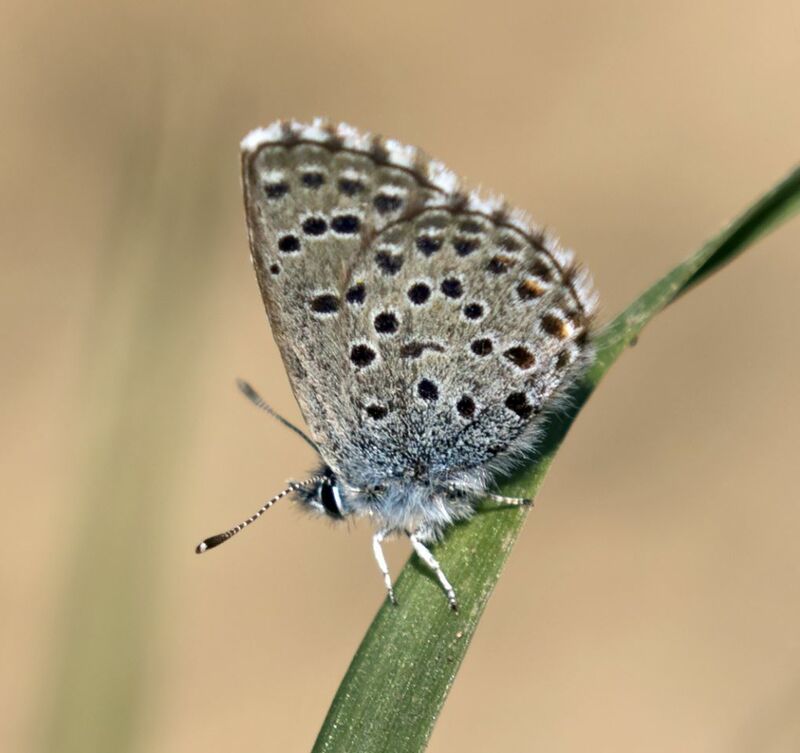 They filled the scope view at 50 x magnification, but my 300mm lens I struggled to capture their magnificence. 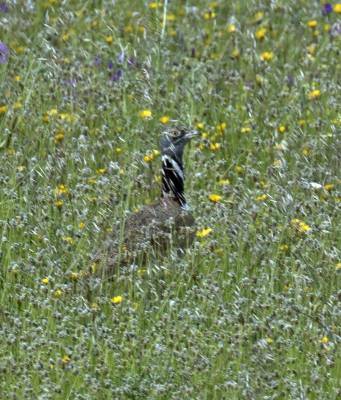 In contrast the male Little Bustards are loners in the breeding season and even harder to photograph than their ‘Great’ relatives in the sea of flowers bedecking their favoured patches. 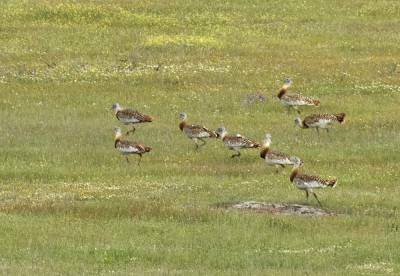 These fabulous birds are seriously threatened, Extremadura remains critical to their long-term prospects. The steppe is also home to Sandgrouse, we were lucky enough to find small groups of Pin-tailed Sandgrouse commuting to stock-up on water at one of the ephemeral, man-made, dew-ponds that dot the landscape. 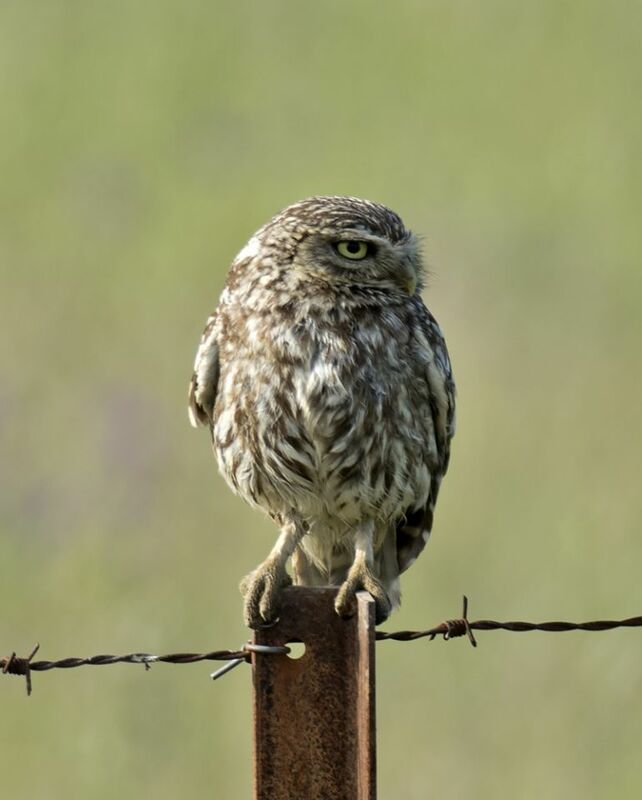 A number of other birds call the steppe home, derelict farmsteads act as enclaves for Lesser Kestrels, Hoopoes and Little owls. Roadside nest boxes adorn telegraph and electricity pylons. 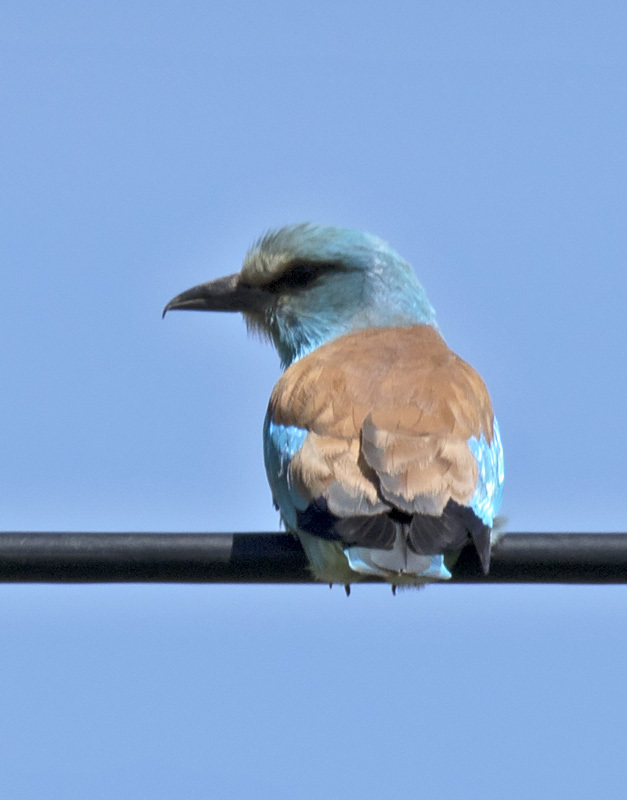 These play host to one of Europe’s most spectacular birds, the Roller. It’s as if an artist thought I’ve got some aquamarine left over from adorning Bee-Eaters and thought they’d use it all up on one bird. Where the steppe transitions into dehesa we often found Eurasian Magpies, where we found these black and white corvids we would also find their parasite. 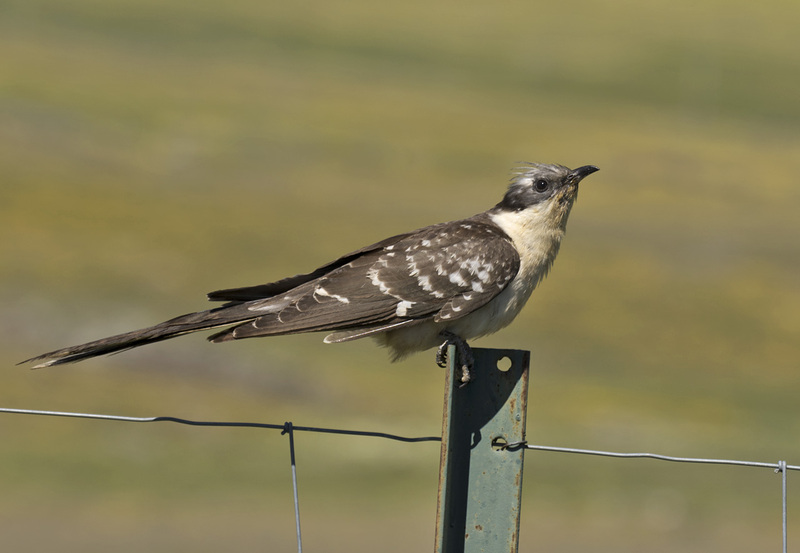 This, Cuckoo-in-the-nest, is no other than the Great-spotted Cuckoo and on this tour, we had some magnificent views of this hairy caterpillar consumer. It was also here, along the ecotone between steppe and dehesa where we consistently found both Woodchat and Southern Grey Shrikes. 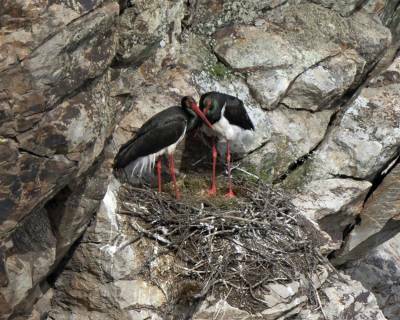 In Extremadura, birds just love hard rock, wherever you get outcroppings, buttresses and pinnacles you find a certain set of birds. Two localities in Monfragüe National Park, Peñafalcón and Portilla del Tiétar stand out. Great congregations of Griffon Vultures swathe the rockfaces with almost every suitable spot holding a nest, Peregrine Falcon’s choose a vertiginous precipice and Black Storks find a home in the lower ledges. 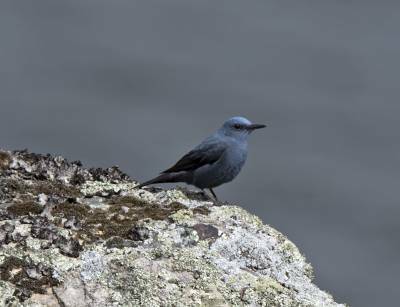 Here too we found some classic rock loving passerines, Black Redstart, Blue Rock Thrush and Rock Bunting, the latter beautifully captured by Laura Bimson using her ‘bridge’ camera. 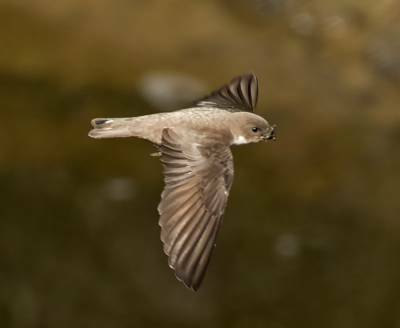 Crag Martins also love these inaccessible cliff faces and were observed bringing back mud to daub their nests. 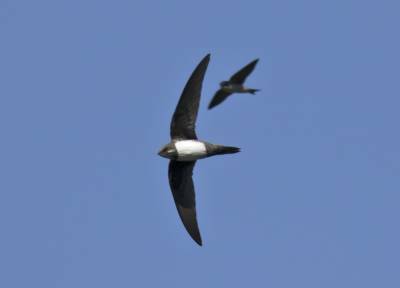 Wherever rivers cut through the landscape you anticipate that hirundines and swifts are seldom far away. 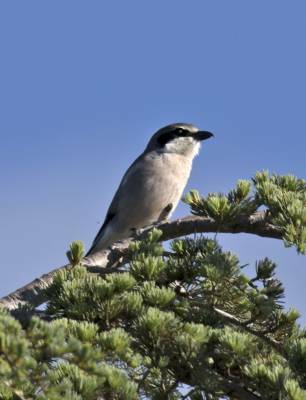 They provide the keen birdwatcher with hours of fun, watching their hawking antics. Conversely, for photographers, it’s hours of frustration attempting to capture them in flight. 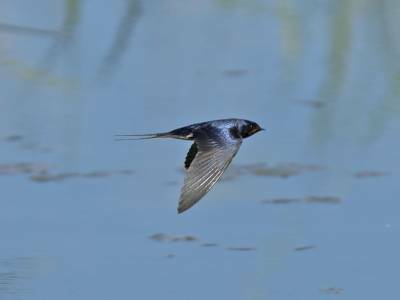 Barn Swallows and House Martins are abundant in Extremadura, but closer scrutiny at hirundine hotspots would reveal Red-rumped Swallows, hiding in plain sight. The bridge at Fuente del Frances was one such hotspot for this activity and patience was rewarded when Alpine Swifts also joined the mass of aerial specialists to sift the aerial plankton. 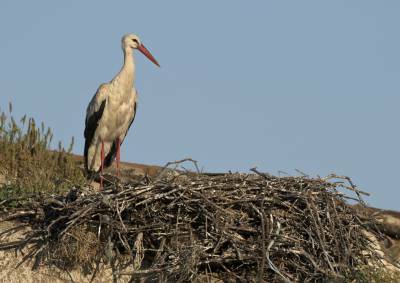 Many of Extremadura’s rivers have been dammed, in some places this creates important wetlands such as those at Arracampo and Alcollarín. Here we would find our last distinctive community of birds. At Arracampo, extensive reedbeds hosted Purple Swamphen, Purple Heron and Little Bittern. 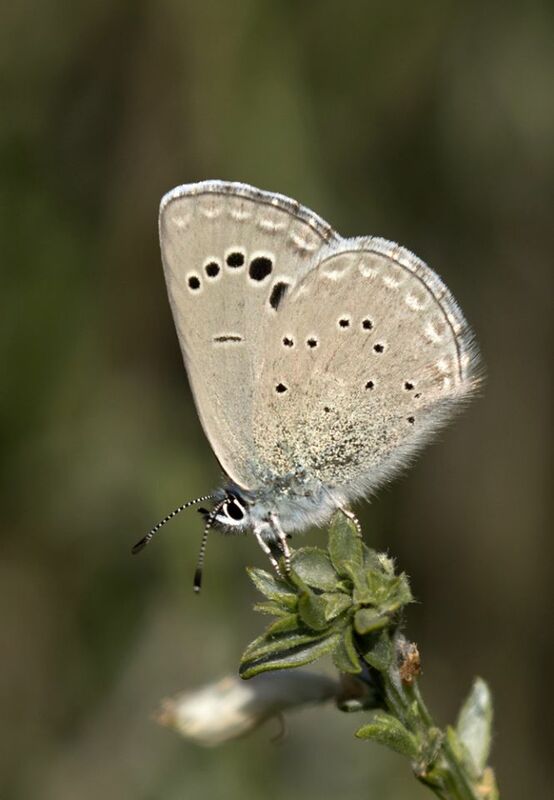 An obliging female of the latter posed beautifully, giving the digi-scopers their chance for a portrait. Alcollarín lacks big reedbeds but its vastness attracts a wide range of birds, whilst there we encountered a passage flock of Black Terns. 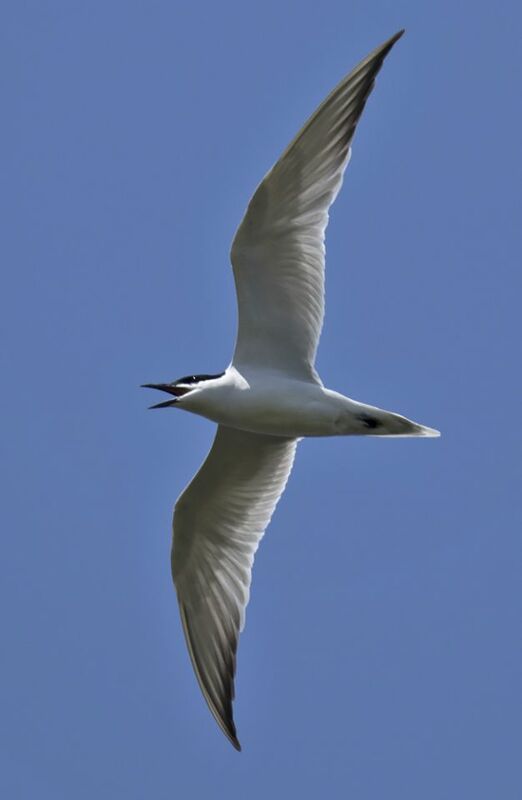 In contrast the Gull-billed Terns were clearly settled and frequently flew close enough for photographic purposes. 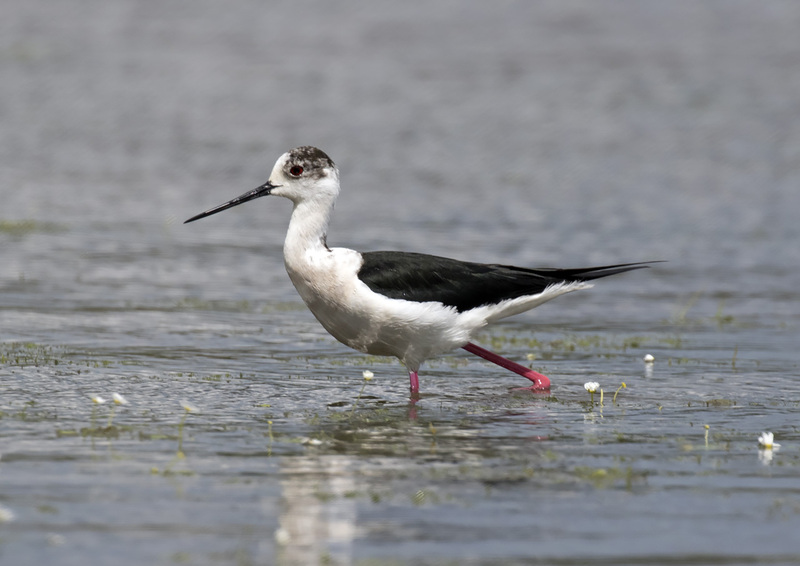 Waders are not a big feature in Extremadura but at Alcollarín Common Redshank and pugnacious Common Sandpipers put in an appearance, alongside that lankiest of marsh birds, the Black Winged Stilt. A slow drive around the reservoir with the windows down was accompanied by a symphony of Nightingales. Every now and again a Woodchat Shrike would be spied on a post, but one of the stand-out highlights came close to the end of the road and the tour. 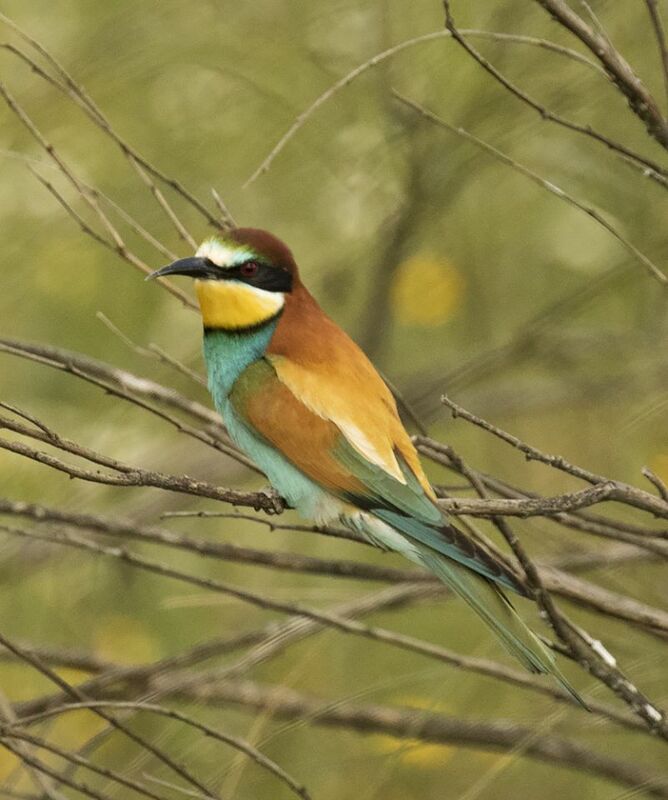 Bee-eaters had decorated our days throughout the week but now a small colony swept back and forth close to our vehicles, periodically perching in nearby bushes and providing an ideal photographic opportunity. 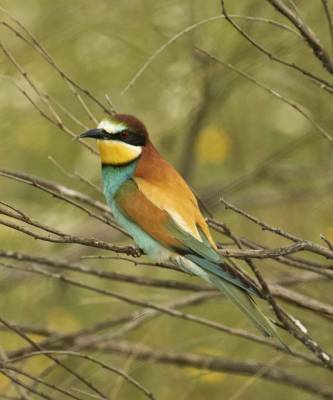 European Bee-eaters wear a coat of many colours and this encounter certainly generated some colourful smiles on the faces of their human admirers. 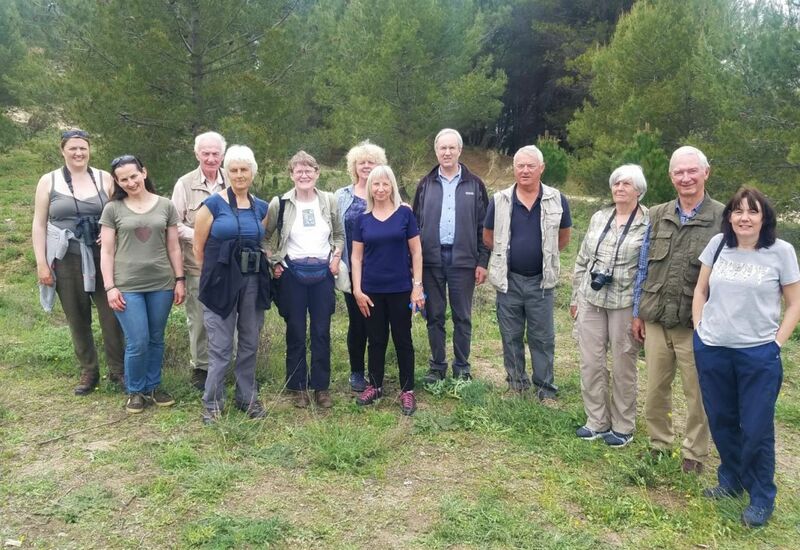 As mentioned previously, for part of our tour we made a point of walking to the heights of Monfragüe Castle, partly to observe the wildlife, but also importantly, to take in one of the greatest vistas in Europe. 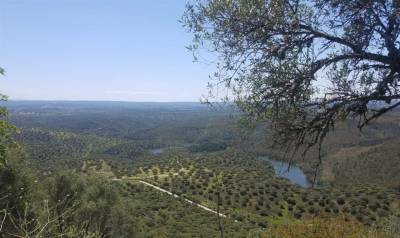 Looking out from the castles ramparts you become acutely aware of the immensity of the landscape and most importantly the vastness of the dehesa. The extensive form of agriculture practised in this region of Spain creates one of the planets biological hotspots. 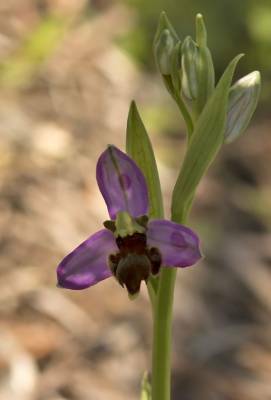 If you visit, do cherish it, the ecology is fragile and even small tweaks of intensification could cause the whole system to collapse. 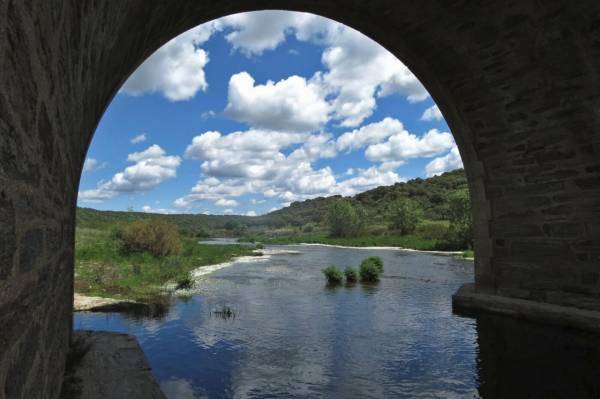 Extremadura is special, but vulnerable; green tourism can help to sustain it. 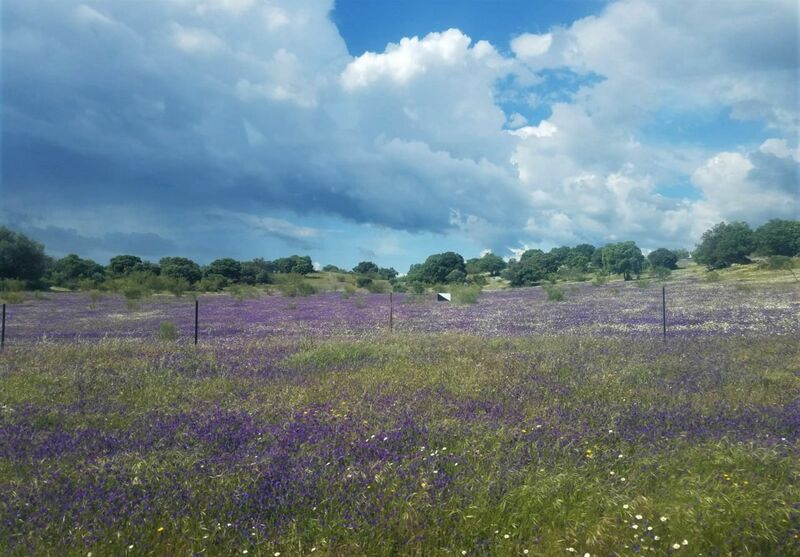 If you have never been to Extremadura, what are you waiting for! To: Teresa Farino, huge thanks for all her hard work in preparing for the tour. Teresa is an outstanding naturalist and the Masterchef of 5-star picnics. To: Casa Rural Las Canteras for providing a great base for our tour and accommodating our erratic evening meal times. To: Our clients for their kindness, fun and friendship during the tour.